The battle for barely there computing supremacy continues unabated. Over the past couple of years, we’ve seen PC makers brag about releasing the lightest 13-inch laptop ever, the most svelte MacBook ever, and the thinnest notebook of all time (though that last one apparently overlooked 2009’s Dell Adamo). Today, Acer launched the Swift 7, the newest usurper of the “thinnest laptop ever” crown. The Swift 7 measures in at a scant 9.9mm thick, compared to 10.4mm for the HP Spectre 13.3, and 10.16mm for the aforementioned Dell Adamo. You could slice cheese with these things. The MacBook 12, meanwhile, clocks in at a comparatively chunky (ha!) 13.2mm thick. Another aspect common to all these limit-pushing laptops: premium design. 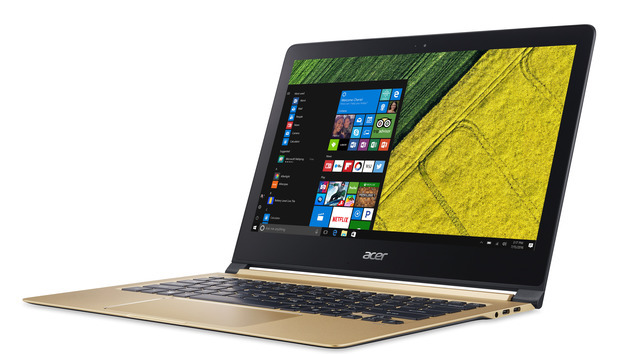 The 2.48-pound Acer Swift 7 is carved from unibody aluminum, and awash in a black-and-gold finish. Those high-end touches extend to the 13.3-inch 1080p display, which features IPS technology for wide viewing angles and color clarity, Gorilla Glass for durability, and Acer’s own BluelightShield tech to minimize eye fatigue. Under the hood, the Swift 7 packs an Intel Core i5-7Y54 processor, a 256GB SSD, 8GB of RAM, and 802.11ac Wi-Fi support, along with a pair of USB C ports and dual Dolby Audio speakers. Of course, premium features come at a premium price. The Acer Swift 7 starts at $1,099. The story behind the story: Thin doesn’t necessarily mean anemic battery life. Like Apple’s diminutive MacBook 12, Acer’s Swift 7 promises up to nine hours of juice. Always take manufacturer endurance claims with a grain of salt, but if that proves true, it’s a seriously impressive feat.